This Dillon 650 bearing kit includes a precision needle bearing and two hardened bearing plates. Installation of the bearing and plates above your shellplate will allow you to use slightly greater shellplate bolt tension, preventing index jerking and spillage of powder when loading calibers like .380 ACP and 9mm Luger. No permanent press modifications necessary. 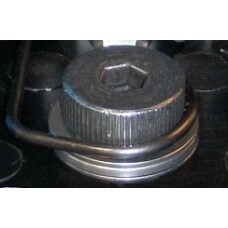 Pictured as installed, kit does not contain pictured press parts, only the bearing and plates under the bolt.